Hi, I am interested in your 1973 Ford Bronco (stock #73CoyoteLegendBronco) listed on Autotrader. I'd like to get more information about this vehicle and confirm its availability. This 1973 Old School Coyote Bronco with Legend 12" coil-over suspension has been built to exceed the Classic Ford Bronco industry's highest standards. This is the most heavy duty Coyote Bronco we've built with Legend 12" coil over suspension. This Bronco surpasses the highest industry standards in Coyote Bronco builds. We used a Factory Bronco frame (not an 'after market' frame) so it's still a TRUE Bronco. We spent years developing a unique 12" coil-over King Shock suspension system with anti-sway bars and a heavy duty steering tie rod system that works great both on and off road. It works great in all driving conditions. 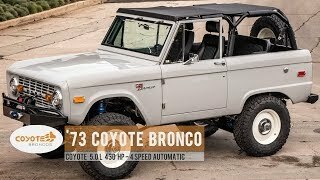 This Coyote Legend Bronco is the first of it's kind, this one actually took 3.5 years to build because we wanted to set the bar HIGH and we feel we accomplished that goal.